It seemed to be everywhere when I saw the opportunity to review pop up, so I hopped on the train! If He's Daring was... not terrible, and not fantastic either. It would have made an excellent novella, I think, and suffered for having a longer word count. There's a lot to like about If He's Daring. This historical romance includes a fairly realistic portrayal (in my opinion, of course) of what life might have been like for people in the Regency period who had a dash of paranormal powers. Catrin's concern for her son is heightened because of her fear that her brother-in-law will be annoyed by her son's tendency to talk to, ah, people who no one else can see. The fears of exposure, public scrutiny and being judged run right through the novel. I liked Catrin - she grew over the novel, I could quickly empathize with her maternal concerns and she didn't beat around the bush when it came to her attraction to Orion. I liked the image of these carriages racing across the countryside, and the back-and-forth between the two groups. What I didn't like? All the thinking over everything. Repeatedly. The book is so repetitive when it comes to debating whether Orion should seduce Catrin or if Catrin should seduce Orion, and what future they might have together (or assuring themselves that they're going into an affair with their eyes wide open, etc., etc.). It drove me batty. The only good part is that I could put the book down, walk away for a day or two, pick it up again and not have to worry about forgetting anything - because it was all recapped for me again and again and again and.... If the book was a hundred pages shorter, I suspect very little of the actual action would have be struck out, and instead we could have just lost all the waffling! As you might guess, I found the pace a tad lagging. Honestly, there are lots of great bits, and the story itself is solid. It was really only the incessant overthinking that drove me crazy. 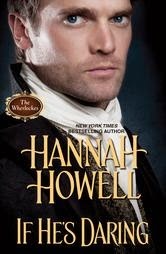 If you're a fan of paranormal historical romance, be aware If He's Daring has a light touch on that front. I'd probably skip this one, but only because I found it a bit slow and there's so many other options out there. Don't take my word for it though, check out the book's tour at Tasty Book Tours for other opinions and a chance to win a print copy of the book!